Keeping Boston Safe: At about 11:20 AM on Wednesday, April 10, 2019, members of the District E-13 (Jamaica Plain) and E-5 (West Roxbury) Drug Control Units assisted by the Drug Enforcement Agency executed a search warrant of an individual in the area of Lamartine Street and Cerina Road in Jamaica Plain. As a result of the search warrant, officers recovered approximately 2.2 grams of crack cocaine and approximately .7 grams of Fentanyl. Officers placed the suspect under arrest at this time. Additionally, officers secured a second search warrant of the suspect’s residence on Greenley Place in Jamaica Plain. At approximately 4:43 PM, officers entered the residence and executed the search warrant. As a result of the search warrant, officers recovered the following items: a 9mm Springfield Armory xp9 semi-automatic firearm loaded with eight rounds of live ammunition, forty-five shotgun shells, twenty-eight rounds of .40 caliber live ammunition, an undisclosed amount of US Currency, approximately 58 grams of Fentanyl, and approximately 27 grams of crack cocaine in total. Officers arrested Apahlo Sullivan, 23-years-old, of Jamaica Plain. Sullivan is expected to be arraigned in West Roxbury District Court on charges including: Unlawful Possession of a Firearm, Unlawful Possession of Ammunition, Trafficking Class A Drugs over 36 grams, Trafficking Class B Drugs Over 18 grams, multiple counts of Distribution of Class A Drugs and Distribution of Class B Drugs. At about 9:11 PM on Wednesday, February 27, 2019, officers assigned to District E-13 (Jamaica Plain) made an onsite arrest and recovered a loaded firearm after hearing shots fired in the area of 130 Heath Street in Jamaica Plain. Officers were on patrol when they heard numerous gun shots and observed a male suspect, later identified as Antonio Garcia-Rivera, 18, of Roxbury, fleeing on foot onto Bickford Avenue. Officers observed the suspect retreat into the rear of 36 Wensley Street before jumping a fence into an adjacent backyard. Responding officers set a perimeter and soon located the suspect lying face down on the ground in the side yard of 46 Wensley Street. Officers placed the suspect in custody and then located and recovered a loaded 9mm Ruger P85 from the backyard of 36 Wensley Street. The suspect will be arraigned in Roxbury District Court on charges of Discharging a Firearm within 500 Feet of a Dwelling, Unlawful Possession of a Firearm, Possession of a Large Capacity Feeding Device and Unlawful Possession of a Firearm. ‘Tis The Season: At district stations all across the city, the men and women of the BPD have certainly been in the spirit of the holiday working hard to secure presents and gifts for kids in their communities so that this Christmas will be one filled with holiday cheer, joy and happiness. 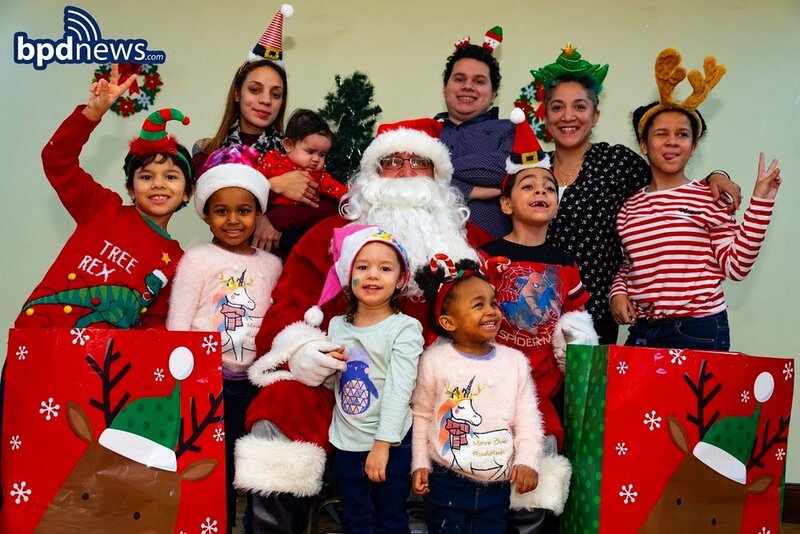 To all of our officers who continue to go above and beyond the call of duty in heart-fueled efforts to secure and provide presents to kids all across our city, we say, “Thank you.” As you can see by the photo recently taken at the District E-13 holiday party in Jamaica Plain, our officers also look pretty good in red sometimes, too. 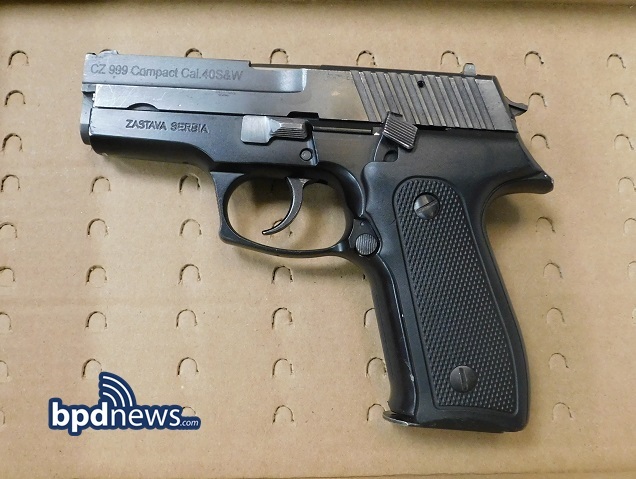 One Less Gun: At about 6:20PM, on Thursday December 6, 2018, officers assigned to District E-13 (Jamaica Plain) recovered a discarded firearm in the area of 277 Centre Street in Jamaica Plain. Officers were on directed patrol when they located a .38 caliber revolver along with a clear plastic bag containing 5 rounds of .38 special ammunition. The weapon has been turned over to the BPD Firearms Analysis Unit for processing. At about 10:15 AM on Wednesday. December 5, 2018, members of the Fugitive Unit made an on-site arrest of a 16-year-old male juvenile in the area of 3347 Washington Street in Jamaica Plain. As part of an ongoing investigation, officers placed the juvenile in custody for several outstanding warrants on charges of Armed Assault to Rob, Assault by means of a Dangerous Weapon, Carrying a Firearm without a License, Unlawful Possession of Ammunition, Receiving Stolen Property, Unlawful Possession of a Firearm with an Obliterated Serial Number, Unarmed Robbery, and Assault and Battery. UPDATE: Victims Identified and Causes of Death Determined in Death Investigation in the area of 60 Bickford Street in Jamaica Plain: At about 5:45pm, on Monday, November 19, 2018, officers from District E-13 (Jamaica Plain) responded to a call for shots fired in the area of 60 Bickford Street in Jamaica Plain. On arrival, officers located two individuals suffering from gunshot wounds. One victim, a 32-year-old male later identified as Jose Dos-Santos of Boston, was pronounced deceased at the scene from an apparent self-inflicted gunshot wound, while a second victim, a 23-year-old female later identified as Lodimira Dos-Santos of Boston, was transported to an area hospital where she later succumbed to her injuries was pronounced deceased. As for the cause and manner of death, the Medical Examiner’s Office has ruled the female’s death a homicide while the male’s death has been ruled a suicide. The Boston Police Department continues to review the facts and circumstances surrounding this incident. Anyone with information is strongly urged to contact Boston Police Homicide Detectives at (617) 343-4470.Community members wishing to assist this investigation anonymously can do so by calling the CrimeStoppers Tip Line at 1 (800) 494-TIPS or by texting the word ‘TIP’ to CRIME (27463). The Boston Police Department will stringently guard and protect the identities of all those who wish to help this investigation in an anonymous manner. At about 5:45 PM on Monday November 19, 2018, officers assigned to District E-13 (Jamaica Plain) responded to a call for shots fired in the area of 60 Bickford Street in Jamaica Plain. On arrival, officers located a male in his thirties suffering from an apparent gunshot wound who was pronounced deceased at the scene. The Office of the Chief Medical Examiner will determine the cause and manner of his death. Officers simultaneously located a female victim in her twenties suffering from apparent gunshot wounds. The victim, suffering life threatening injuries, was transported to an area hospital where she later succumbed to her injuries and was pronounced deceased. The victim has since been identified as 23-year-old Lodimira Dos-Santos. Officers also located a male victim in his thirties who was transported to an area hospital for treatment of a non-life-threatening stab wound. The death of Dos-Santos marks the city’s 49th homicide of the year. ONE LESS GUN: At about 10:13 PM on Saturday, November 17, 2018, members of the Youth Violence Strike Force made an onsite arrest and recovered a firearm in the area of 950 Parker Street in Jamaica Plain. Officers were on patrol in the above area when they observed a group of males known to them through previous encounters, walking down the street. As officers attempted to speak with the males, one of them immediately began to flee the area. Officers gave chase to the male, who attempted to enter the residence at 950 Parker Street, a violent struggle occurred in the entryway to the residence. While officers were struggling with the suspect, a second male arrived on scene and attempted to intervene, the male began fighting with officers, but was subsequently placed under arrest. At this time, a female suspect exited the residence and began shouting at officers, who were still attempting to place the first male suspect under arrest. Officers continued struggling with the male who was clenching an object close to his chest. Officers were eventually able to identify the object to be a loaded firearm. Upon noticing the firearm, the female suspect began to physically assault officers as they attempted to remove the firearm from the male suspect. Eventually officers were able to place both the male suspect and his mother, the female suspect, under arrest. A .32 caliber Charter and Arms Undercover Revolver loaded with six rounds of live ammunition was secured at the scene. Officers arrested a 17-year-old- juvenile male of Weymouth, who is charged with Delinquent to Wit: Unlawful Possession of a Firearm, Unlawful Possession of a Loaded Firearm, Resisting Arrest, Assault and Battery on a Police Officer with Injuries and Trespassing. A second 17-year-old male of Dorchester was also arrested and charged with Delinquent to Wit: Assault and Battery on a Police Officer with Injuries, Resisting Arrest, and Trespassing. The female suspect, identified as Shirley Thompson, 40-years-old, of Weymouth is charged with Assault and Battery on a Police Officer with Injuries, Resisting Arrest, and Trespassing. All suspects are expected to be arraigned in Roxbury District Court. DIFFERENCE MAKER: On Friday, October 26, 2018, Boston Police Officer Antonette Cabral was honored at the 2018 Action for Boston Community Development (ABCD) Community Heroes Celebration for her work as a community service officer in District E-13 (Jamaica Plain). Officer Cabral was recognized for her work as a mentor for at-risk youth who attended the ABCD Summerworks program and the Boston Police Teen Academy. Through her dedication to expanding opportunities for the City’s at-risk youths, Officer Cabral has proven that her hard work and determination does not go unnoticed by the community she continues to serve.